How Do I Get to the Quilt Show? The WFCU Centre is just 10 minutes from Hwy 401, 20 minutes from both international crossings – the Ambassador Bridge and the Windsor-Detroit Tunnel. Visitors can access free parking or take advantage of Transit Windsor bus transportation. Bus parking must be prearranged by contacting Donna at 519-250-4970 or donnajones3630@mail.com. For directions, go to http://www.wfcu-centre.com then click on parking and directions at the bottom of the page. Giveaways and Door Prizes Every person who who enters will receive a business card holder and will be eligible to win one of 25 wonderful door prizes selected for quilters and non-quilters. Advance Tickets Admission is $6.00. Advance tickets can be requested for large groups or groups with special needs. Special offers are available for supervisors or attendants of students groups, seniors’ groups and special needs individuals. Contact Donna at donnajones3630@gmail.com or 519-250-4970. Tickets $2.00 each or 3 for $5.00, sold at the show. Proceeds will support the WQG’s Comfort Quilt Program which donates hundreds of quilts, pillowcases and other items to needy groups and institutions in Windsor and Essex County. The Windsor Quilters’ Guild has a long history of giving back to the community. As part of every quilt show, the guild organizes a raffle and the proceeds are given to a designated charity. Over the last 12 years, the guild has donated more than $52,000 to different charities in Windsor and Essex County. For the 2019 Quilt Show, the raffle proceeds will be going to the guilds Comfort Quilt Program. What is Comfort Quilts? In short, this is a program to warm bodies and hearts. Donated fabric from guild members is turned into quilts and quilted items which are donated to over 30 needy groups and institutions. In 2018 alone, the Comfort Quilt Program donated 188 quilts, 176 pillowcases and over 50 quilted placemats. In addition to quilts and pillowcases for Hospice and Ronald McDonald House, we also Donated preemie hats and baby hats, bassinette and incubator pads, blankets and mattress covers to the Pediatric Unit, NICU and Child Life Program. We are also active in the Beads of Courage program, creating bags for children from infancy to age 18, who are receiving treatment for serious and often fatal illnesses. Each time a child undergoes a procedure they collect a glass bead which they store in the bags we make. To date we have donated 258 bags. Although our members willingly donate much of the fabric and their time to these projects, such things as batting, backing, cording, etc. must be purchased to complete the projects. It is for this reason that the guild has voted to donate this years proceeds to support Comfort Quilts. Comfort Quilt items will be showcased at the show May 3, 10 -6 and May 4, 10 – 4 at the WFCU Centre, 8787 McHugh Street, Windsor. We welcome your support. Raffle tickets can be purchased at the show. Create a wall hanging or quilt of any shape. The quilt must be three layers and be quilted . The minimum circumference must be no less than 96 inches (24×24) and the maximum circumference no more than 144 inches (36 x 36). The front of the quilt must use at least 40% of the 3 fabrics provided not including borders and binding. You may use up to 3 additional Stonehenge fabrics which will be available from one of our local quilt shops (more on this later). There are no limitations on techniques you may use such as thread painting, appliqué, embroidery, etc. There is no theme. Use a pattern or create your own design. $5 is required to purchase your fat quarter bundle of the three fabrics. The $5 will be returned if you hand in a completed challenge quilt. This past year we enjoyed a presentation from “Quilts of Valour”. Janet Bergeron, the rep for Windsor/Essex and Don Oliphant, the Chatham rep explained that Quilts of Valour relies on quilters like ourselves to fill the need for quilt blocks, tops and quilts for veterans, injured Canadian service men and women, and to provide comfort and support for our servicemen in need. The organization had its beginnings with Leslie Zwaal in 2006 who was so impressed by the determination of our Canadian servicemen to fight not only for Canada but to willingly return to battle to be sure others could secure the freedom we have that she determined to make a quilt for every serviceman to show our appreciation for their sacrifice. These quilts presented at special ceremonies to veterans and servicemen do make a difference. Janet invited us to join them on “Sew Day” in Essex once a month or to go ahead and make our own blocks, or quilts which they would gratefully collect and complete. For further information on how you can help go to “quiltsofvalour.ca. 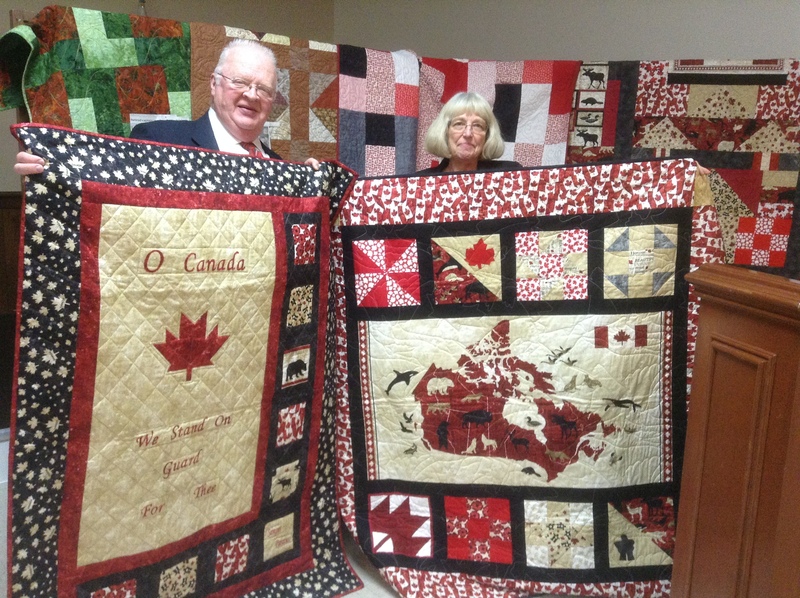 Don and Janet display two of the quilts that have been made for Quilts of Valour. 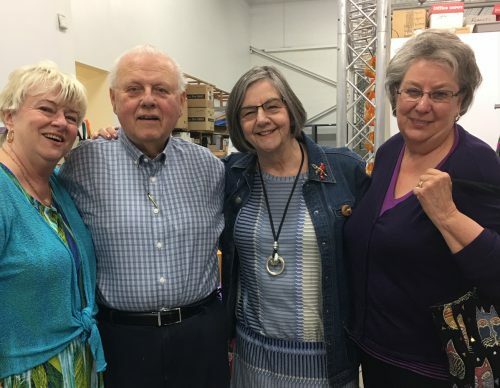 Janet thanked the members of our guild who have already participated in this very worthwhile venture by donating quilts, sewing blocks and quilting quilts.